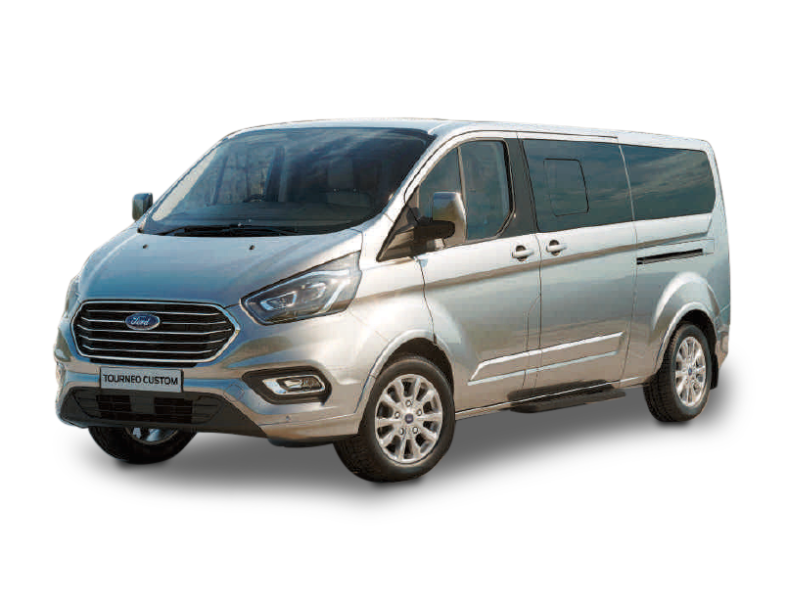 We are proud of our long standing partnership with Ford and are excited to offer unbeatable minibus leasing deals for the new Ford Tourneo Custom. Contact us today for details of our leasing options and finance packages. Discover the luxury of space. The most rewarding journey begins before you move. People carriers don’t come any more versatile than the sensational Tourneo Custom. 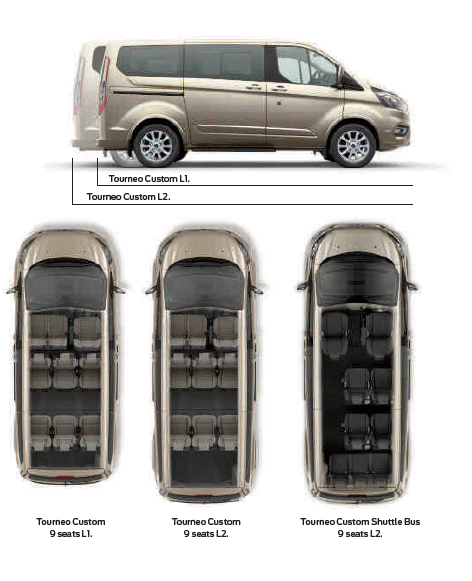 With its new conference seating layout, Tourneo Custom’s spacious interior is as flexible as it is comfortable. Two versions are available: Versatile Conference Seating (standard on Zetec), offering second row individual seats, and third row 2+1 seats; and Highly Versatile Conference Seating (standard on Titanium, Titanium X and Sport), with second and third row individual seats for the ultimate in versatility. Individual second row seats can rotate to face the front or the rear and all seats can fold, tumble, stow or be removed to meet your requirements. 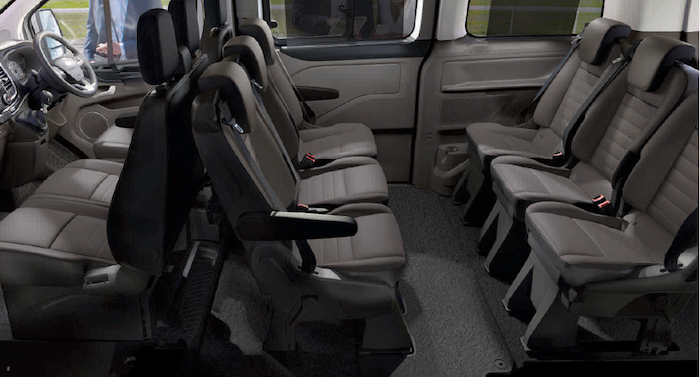 Choose from the L1 with ample space for up to nine people, the L2 with its increased rear luggage space or the Tourneo Custom Shuttle Bus featuring Direct Access Seats. Whichever model you favour, you’ll find its adaptable interior can be easily tailored to suit your business or family transport needs. Note: A rear-facing child seat must not be fitted to the second row seat when they are rearward facing towards the third row. 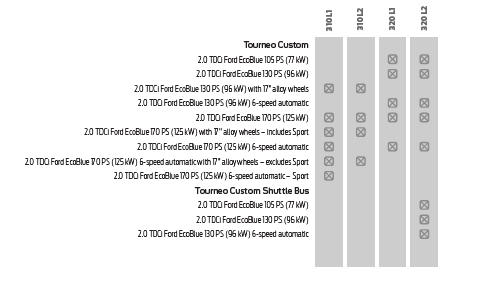 With a focus on passenger comfort, the Tourneo Custom Shuttle Bus offers generous space in each of its four rows of Direct Access Seats. Rear seating is easily reached from the kerb-side sliding side door, and it’s the ideal way to prioritise passenger comfort and mobility over luggage space. Accommodate up to nine people in high-quality comfort. Fold the rear seat backs to create a flat workspace. Or rotate, fold, tumble or stow the rear seats in numerous different ways to create limousine-like space or to maximise the luggage area, without leaving any seats behind. On delivery, the seats are arranged in conference seating mode, so that the rear seat rows face each other for easy conversation between passengers. However, the rear seats can easily be rearranged to keep everyone happy. If you need even more room, the rear seats can be removed completely, individually or in sets, to leave a large and versatile space for whatever you want to carry. Note: A rear-facing child seat must not be fitted to the second-row seat when they are rearward facing towards the third row.